What do you think of my hypothesis? "The Thinking Toolbox" by Nathaniel and Hans Bluedorn, with illustrations by Richard LaPierre, is the best book ever published on logic because it is as accessible for high-schoolers as it is for ink-stained wretches who have been on the job for more than three decades. How would you decide whether to accept or reject my hypothesis? You could simply dismiss it as the product of self-interested bias because you suspect that I am being paid to say nice things about the book since an ad for it appears on this blog. Or you might conclude my hypothesis couldn't possibly be true because you checked my credentials and discovered that I failed Philosophy 101 during my sophomore year in college. Maybe you reject my hypothesis because, after consulting Amazon.com's top sellers list and finding it ranked at number 73,227, you decide the odds are good that another book on thinking has probably sold far more copies and is therefore better. Possibly, you consider yourself an expert thinker now and so dismiss "The Thinking Toolbox" as not worth your time because it is unlikely to teach you something you haven't already known for a long time. 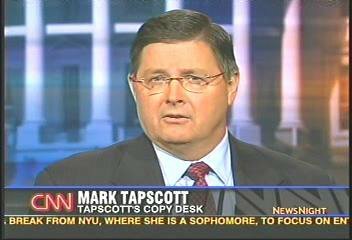 On the other hand, perhaps you go the opposite direction and immediately accept my hypothesis as true simply because you are a long-time reader of Tapscott's Copy Desk and you always agree with what I write here, so I must be right about "The Thinking Toolbox." Or you don't know me from atom and you've only just discovered my blog today, but you are impressed with how utterly confident I sound in propounding my hypothesis, so you figure I must be right and you start telling everybody you meet that they should read "The Thinking Toolbox" because it is the best book ever written on the subject. Common though they are, every one of these conclusions is an example of a particular flaw in thinking. These are common in everyday life because we all at one time or another rely on such thinking in evaluating news we hear or read, choosing among products we are considering purchasing, deciding our opinion of somebody we've just met, or in a thousand other situations. Life is like that, right? That's true, but wouldn't it be cool to be able to sharpen our wits - if only to silence that irritating know-it-all liberal (or conservative) blowhard at the office - without having to go back to school and sit through that unbelievably arrogant graduate teaching assistant's mind-numbingly boring lectures in Philosophy 101? That's the value of "The Thinking Toolbox." This is not to suggest that this book is an easy read or that it won't make you work for the benefits it offers. There are 35 chapters, each two or three pages long and focusing on a particular aspect of effective thinking. There are lots of exercises at the end of each chapter, many of which do require a modest committment of time and brain power. The chapters are divided into four divisions, including Tools for Thinking, Tools for Opposing Viewpoints, Tools for Science and Projects. Every chapter is accompanied by pleasant illustrations and a photo here and there. This is not a "Thinking Smart for Dummies" kind of book. If you seek a college-level textbook stuffed to the gills with historical descriptions of the development of various approaches to philosophy or complicated explications of the different schools of thought about controversies over things like the relationship - if any - between language and meaning, then this book is not what you want. "The Thinking Toolbox" is indeed equally accessible for folks who are just begining to learn how to think as well as those who think they have been thinking well for decades precisely because it is crisp, to the point and devoted to describing the basics of logic, deductive and inductive reasoning, ferreting out hidden premises and much else. The exercises at the end of each chapter make "The Thinking Toobox" especially useful for home-schooling parents and high school teachers, but the book would work equally well as a refresher for a newsroom full of jaded journalists who think they've seen it all, heard it all and done it all. They probably have, incidentally, they just really don't know what to make of it all. Hey, wait a minute. You almost got me! You'll learn more if you buy the book and figure it out for yourself. Will Bush "Turn Over" FEC to McCain?